Behold, Men Macho Ramen. It’s not Japan’s best ramen establishments, but as far as over-the-top noodle restaurants go, this is the over-the-toppiest! In Japanese, the restaurant’s name is a pun: “Macho” (マッチョ or maccho) means, well, “macho” but could also be a pun on “much,” while “men” (麺) literally means “noodles.” Geddit? Clever! 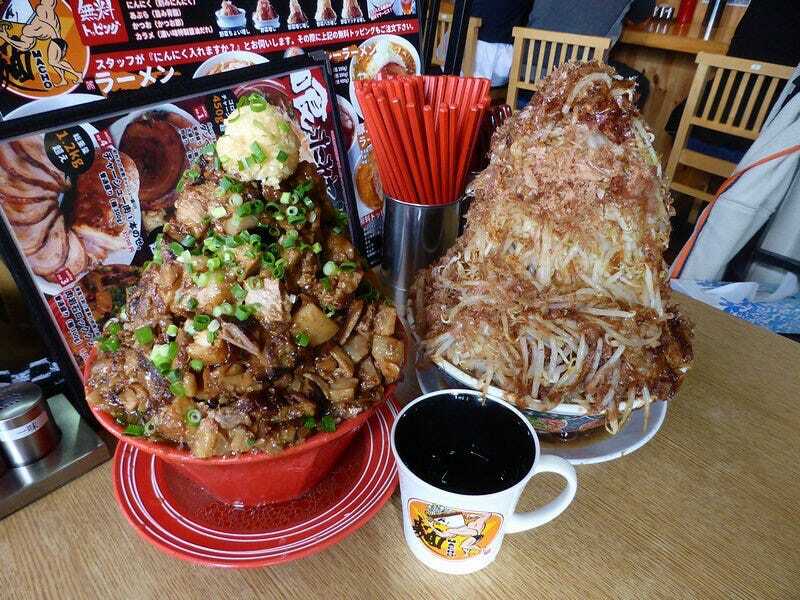 Numerous other eateries in Japan also serve silly-sized food, but Men Macho is setting a very high bar. Literally! Men Macho, which is located in Niigata, offers up various sizes of veggie toppings, like the Vegetable Crazy Increase or the staggering Vegetable Macho Increase. Hope you like bean sprouts and cabbage! The most amazing thing is that these veggie toppings are free of charge. You can also get complementary tea and bowls of rice. Large orders of ramen with more pork slices, however, cost extra. Most of the huge orders of ramen are priced between 1,000 and 1,300 yen (~$8-$11). How about 2 kilos (4.4 pounds) of fries? This restaurant is not playing around. So, that means in the top photo, the meat mountain ramen on the left is 6,500 yen, while the ramen on the right, with its free veggie toppings, is only 853 yen (US$7). This is the Meat Rock Climbing Ramen. It weighs over 3 kilograms (6.6 pounds) and is priced at 6,500 yen (US$53). Madness! The never-ending bowl of beef and noodles.